A large business park in San Ramon began hosting a pair of driverless parking lot shuttles Monday in a program that could eventually lead to wider adoption of the so-called "autonomous vehicles" in the region. 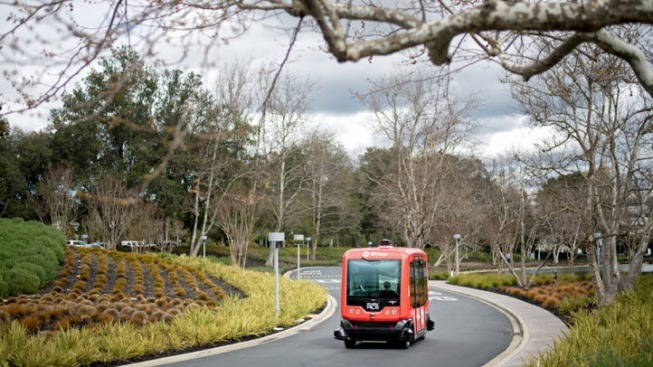 The shuttles are part of a pilot program at the Bishop Ranch business park, home to 30,000 employees, to demonstrate the effectiveness of the technology in the hope that it could lead to the incorporation of driverless vehicles by public transit agencies and private fleet operators. It's the first such pilot program in the state, according to organizers. "I think that transportation is a system and this is one cog in the transportation wheel," said Alex Mehran, chairman and CEO of Sunset Development Co., which owns and operates the business park. The vehicles can hold 12 passengers and will tool about in an empty parking lot, where Bishop Ranch tenants and their employees can hop aboard for test rides, Mehran said. This phase of the project will last about two months. When it's complete, the shuttles will operate on routes in the park's regular parking lots for about six months, bringing employees from their cars to their offices and back again. After that, the vehicles, or ones like them, could begin operating on public roads, possibly taking San Ramon residents to BART stations or other transportation hubs, Mehran said. In order to make the jump from parking lot shuttles to something more widespread, the project would need approval from local, state and federal transportation authorities, as well as the California Legislature. Mehran said he became interested in the technology after reading about it and started talking about a possible project with Randall Iwasaki, executive director of the Contra Costa Transportation Authority. The shuttles were first tested at the GoMentum Station in Concord, which is the CCTA's transportation lab where driverless technology is run through its paces prior to hitting the streets.